Recently I've decided to begin my ultimate castle building that I'll display at home. 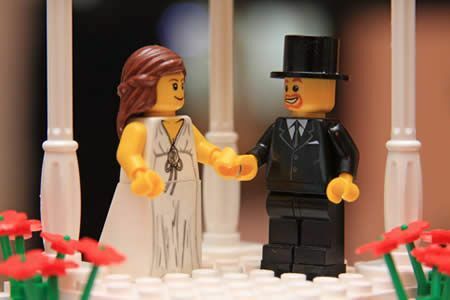 This also will require as much minifigures as I can, so I started to check for some minifigures on internet, one of them is this bride/greek-style-dress minifig. I've already searched on bricklink with no sucess (by using keywords like ("white torso","slope 65 white" and others in a deep piece-by-piece search). There is an equivalent torso with flesh arms from the Indiana Jones series, but I'm toward the classic yellow colored torso assembly. I would presume someone used a sharpie to yellow over the flesh printing on the Indy torso you've referenced. Short of going through every white torso on bricklink, I do not know how I would confirm that. I think Steve is probably right. Looks like that applying the yellow sharpie to the torso is something that I have to test in a common torso first. I saw some pictures and looks good to me! The bride/greek-woman slope is another piece that I didn't find in BL, thought probably is a sticky print over a white slope 65 2x2x2, which I'll draw with no problem. Here's one I did a while ago. If i were doing it again, I'd be more careful not to color "outside the lines" at the top of the torso.